Amberwood provides the livability of a bigger home in a single-story floor plan. When you arrive home, the Everyday Entry™ gives you a place to drop your keys and stow kids’ backpacks. 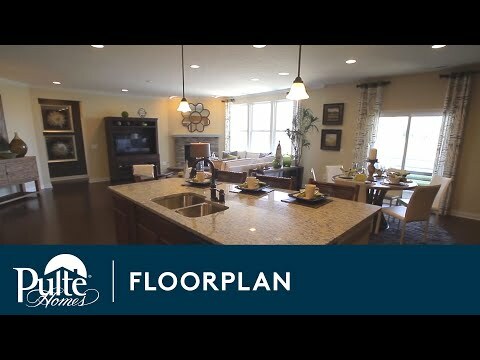 The Pulte Planning Center® helps organize your busy life. And the interconnected kitchen (with island), gathering room, and café dining area enable both weekday relaxing and weekend entertaining. An open single-level floorplan, the Amberwood balances private living and entertaining with its spacious Owner’s Suite and chef's kitchen. A large island in the kitchen provides extra seating and looks into the café and gathering room. The convenient flex room can also become a den or bedroom to fit your family’s needs. Enjoy a sizable walk-in closet in the Owner's Suite for all of your storage needs.